Gritty, distorted and raw; masterminds, hip-hop emcee Bru Lei and music producer JustLuv Istheillest released their project, CrazyHair on March 1 in, where else, an old warehouse (that’s so Sactoe!). Crazy it was, indeed. I personally was not able to see it in person which is why I am asking all of you to please reply to this post with all of your experiences and opinions about this film. I had the pleasure of watching this film in the privacy of my home. Chopped, screwed, dubbed and all sorts of trapped out, CrazyHair couldn’t have been any more insane unless it was the Hip Hop version of Chainsaw Massacre with its monotone rapping, singing and no-emotion faced characters. Even the crazy set design, scary, cheesy and surreal; all made by local muralist Shaun Burner (Founder of ArtHotel and Trust Your Struggle Art Collective) set the stage just right. “Here is what i predict…some where in the not to distant future… in some isolated land there will be a colony that celebrates all things Sac Toe style…weather it be a russian, a scadenavian, a phillipino, or a hmoung community…there is going to be a generation of kids who will be sporting midtown mafia shirts, bumpin bedroom trap, and wildin out to all things SacToe…somehow i have feeling this town will be run by charismatic cult leader by name of JustLuv Istheillest…why do i get the feeling that Bru Lei will be the deity they all will be worshiping…proud of all my folks who put this together…this is generations ahead of the game…much love and deepest respect to everyone who made this happen. Plus that World Premier was off the chain.” says Brian Anthony, a local Sacramento graffiti-muralist and clothing line founder. Of course, in the film itself, DIY masters, Bru Lei plays Blackbeard, the friend of Paw MItch-ILL (JustLuv) the “illest hair dresser.” This is the break-up story of Paw MItch-ILL who has just found out his girlfriend has been cheating on him with Supa Cuts, played by Marc Mojonier (Co-Producer and Sacramento event organizer and promoter). He is a barber who drinks too much alcohol and does too many drugs (mushrooms, weed or coke anyone?) He enjoys partying while his barbershop job takes center stage in his daytime life. The only thing keeping his debauchery from killing himself is his friend Blackbeard. This film co-stars (and is co-written) by Bru Lei as a supporting actor who is always in the back rapping some pretty lyrical flows, I might add. Other film; er video minor parts are performed by trap singer-songwriter Maryann Hunter (Maryann Baegod) who also co-directed Crazyhair with her significant other and label mate, Nate (Sbvce) Curry both of the Bedroomtrap camp. Of course, Cole Rogers (Agustus ThElefant) makes an appearance emceeing during a party-time video. JustLuv has known Rogers since they were kids and have been working on music together just about as long. Even Wu-Tang Clan member, Cappadonna of the Staten Islands has a guest voice appearance in one of the videos. Other minor roles are Tiana Garner playing Lori-ILL (local hairstylist) staring opposite of Paw-MItch-ILL on the phone, Emcee Tactikz and guest appearances by Mike D A.K.A. Non (Tribe of Levi) and Skurge (Righteous Movement). I do believe that possibly being on some type of intoxicating beverage or drug (you pick) may make this film super worthwhile to watch, otherwise, you are left deciphering what you just watched. I want to know your opinion. What are your thoughts about this film. You can watch it below and then comment. 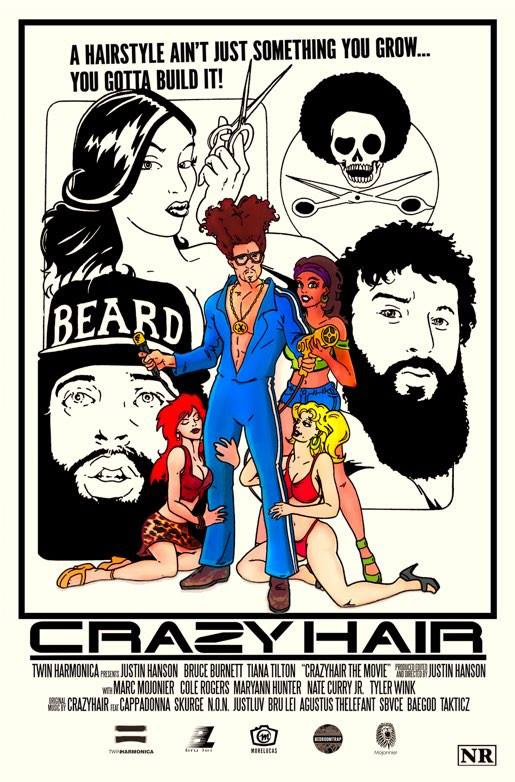 This film, Crazyhair is truly as unique as Sacramento’s music and art scene and portrays similar real-life drama circumstances that you may have heard about or even experienced yourself.